大数据应用, Hadoop 仅仅是一个基础, 要用起来还需要安装很多组件, 比如Hive, Mahout, Sqoop, ZooKeeper 等等, 不得不需要考虑兼容性的问题: 版本是否兼容，组件是否有冲突，编译能否通过等, 一大堆事情. 真正要在企业中要用Hadoop, 我一般不推荐直接使用apache hadoop, 使用第三方发行包最稳定/最省事了. 第三方发行商, 有 Cloudera, Hortonworks, MapR, Cloudera 用户数最多, 另外 Hadoop之父目前也供职于Cloudera, 选它基本上没错. CDH (Cloudera’s Distribution, including Apache Hadoop), 是Cloudera发行的Hadoop发行版,基于稳定的Hadoop版, 并集成了许多补丁, 可以直接在生产环境中使用. Cloudera Manager 是 Cloudera 推出的大数据解决方案, 已经在安装/配置/监控方面做了大量的工作.它不仅包含CDH, 而且集成了很多常用的组件, 比如 HBASE, Hue, Impala, Kudu, Oozie, Kafka, Sentry, Solr, Spark, YARN, ZooKeeper 等, 它分为两个版本Cloudera Express 和 Cloudera Enterprise . Cloudera Express免费使用, Cloudera Enterprise 需要支付费用. Express版和Enterprise版差异不算大, 而且可以商用, 缺的只有非常高级的功能以及官方支持. 考虑到网速和墙的因素, 建议离线的方式安装, 即Manual Installation Using Cloudera Manager Tarballs安装方式. 使用VM是最快的体验环境搭建方式了, Cloudera 提供 QuickStart VM, 我们还有另一个选择, 即 Oracle Big Data Lite VM. Cloudera quickstart VM 下载介质较小, 不到5GB, Oracle Big data lite VM大多了, 要30GB. 我推荐Cloudera quickstart VM. VirtualBox虚拟机网络默认采用NAT(网络地址转换模式)模式, 在该模式下, 虚拟机可以通过主机来连接上internet网络, 非常简单, 我也一直使用这种模式. 办法是有的, 通过端口转发即可, 其实quickstart VM已经给我们将VM上常用的大数据服务端口作了映射.比如 VM hue 端口 8888, 映射到host的同一端口上了. 为了防止guest OS和host OS的ssh 22端口冲突, 我将VM的22端口映射到2022, 将VM的Oracle 1521端口映射成主机的2521端口. R is a programming language and software environment for statistical analysis, graphics representation and reporting. R was created by Ross Ihaka and Robert Gentleman at the University of Auckland, New Zealand, and is currently developed by the R Development Core Team. The core of R is an interpreted computer language which allows branching and looping as well as modular programming using functions. R allows integration with the procedures written in the C, C++, .Net, Python or FORTRAN languages for efficiency. R is free software distributed under a GNU-style copy left, and an official part of the GNU project called GNU S.
R was initially written by Ross Ihaka and Robert Gentleman at the Department of Statistics of the University of Auckland in Auckland, New Zealand. R made its first appearance in 1993. A large group of individuals has contributed to R by sending code and bug reports. Since mid-1997 there has been a core group (the “R Core Team”) who can modify the R source code archive. R is a well-developed, simple and effective programming language which includes conditionals, loops, user defined recursive functions and input and output facilities. R provides a suite of operators for calculations on arrays, lists, vectors and matrices. R provides a large, coherent and integrated collection of tools for data analysis. R provides graphical facilities for data analysis and display either directly at the computer or printing at the papers. As a conclusion, R is world’s most widely used statistics programming language. It’s the # 1 choice of data scientists and supported by a vibrant and talented community of contributors. R is taught in universities and deployed in mission critical business applications. This tutorial will teach you R programming along with suitable examples in simple and easy steps. You really do not need to set up your own environment to start learning R programming language. Reason is very simple, we already have set up R Programming environment online, so that you can compile and execute all the available examples online at the same time when you are doing your theory work. This gives you confidence in what you are reading and to check the result with different options. Feel free to modify any example and execute it online. For most of the examples given in this tutorial, you will find Try itoption at the website, so just make use of it and enjoy your learning. As it is a Windows installer (.exe) with a name “R-version-win.exe”. You can just double click and run the installer accepting the default settings. If your Windows is 32-bit version, it installs the 32-bit version. But if your windows is 64-bit, then it installs both the 32-bit and 64-bit versions. After installation you can locate the icon to run the Program in a directory structure “R\R3.2.2\bin\i386\Rgui.exe” under the Windows Program Files. Clicking this icon brings up the R-GUI which is the R console to do R Programming. As a convention, we will start learning R programming by writing a “Hello, World!” program. Depending on the needs, you can program either at R command prompt or you can use an R script file to write your program. Let’s check both one by one. > myString <- "Hello, World!" Here first statement defines a string variable myString, where we assign a string “Hello, World!” and then next statement print() is being used to print the value stored in variable myString. Save the above code in a file test.R and execute it at Linux command prompt as given below. Even if you are using Windows or other system, syntax will remain same. When we run the above program, it produces the following result. Though above comments will be executed by R interpreter, they will not interfere with your actual program. You should put such comments inside, either single or double quote. In R programming, the very basic data types are the R-objects called vectorswhich hold elements of different classes as shown above. Please note in R the number of classes is not confined to only the above six types. For example, we can use many atomic vectors and create an array whose class will become array. When you want to create vector with more than one element, you should usec() function which means to combine the elements into a vector. While matrices are confined to two dimensions, arrays can be of any number of dimensions. The array function takes a dim attribute which creates the required number of dimension. In the below example we create an array with two elements which are 3×3 matrices each. Factors are created using the factor() function.The nlevels functions gives the count of levels. A variable provides us with named storage that our programs can manipulate. A variable in R can store an atomic vector, group of atomic vectors or a combination of many Robjects. A valid variable name consists of letters, numbers and the dot or underline characters. The variable name starts with a letter or the dot not followed by a number. var_name% Invalid Has the character ‘%’. Only dot(.) and underscore allowed. var.name valid Can start with a dot(.) but the dot(. )should not be followed by a number. .2var_name invalid The starting dot is followed by a number making it invalid. The variables can be assigned values using leftward, rightward and equal to operator. The values of the variables can be printed using print() orcat()function. The cat() function combines multiple items into a continuous print output. # Assignment using equal operator. # Assignment using leftward operator. # Assignment using rightward operator. Note − The vector c(TRUE,1) has a mix of logical and numeric class. So logical class is coerced to numeric class making TRUE as 1. In R, a variable itself is not declared of any data type, rather it gets the data type of the R – object assigned to it. So R is called a dynamically typed language, which means that we can change a variable’s data type of the same variable again and again when using it in a program. To know all the variables currently available in the workspace we use the ls()function. Also the ls() function can use patterns to match the variable names. "my var"     "my_new_var" "my_var"     "var.1"
Note − It is a sample output depending on what variables are declared in your environment. The ls() function can use patterns to match the variable names. # List the variables starting with the pattern "var". The variables starting with dot(.) are hidden, they can be listed using “all.names = TRUE” argument to ls() function. ".cars"        ".Random.seed" ".var_name"    ".varname"     ".varname2"
 "my var"       "my_new_var"   "my_var"       "var.1"        "var.2"
Variables can be deleted by using the rm() function. Below we delete the variable var.3. On printing the value of the variable error is thrown. All the variables can be deleted by using the rm() and ls() function together. An operator is a symbol that tells the compiler to perform specific mathematical or logical manipulations. R language is rich in built-in operators and provides following types of operators. Following table shows the arithmetic operators supported by R language. The operators act on each element of the vector. Following table shows the relational operators supported by R language. Each element of the first vector is compared with the corresponding element of the second vector. The result of comparison is a Boolean value. > Checks if each element of the first vector is greater than the corresponding element of the second vector. < Checks if each element of the first vector is less than the corresponding element of the second vector. == Checks if each element of the first vector is equal to the corresponding element of the second vector. <= Checks if each element of the first vector is less than or equal to the corresponding element of the second vector. >= Checks if each element of the first vector is greater than or equal to the corresponding element of the second vector. != Checks if each element of the first vector is unequal to the corresponding element of the second vector. Following table shows the logical operators supported by R language. It is applicable only to vectors of type logical, numeric or complex. All numbers greater than 1 are considered as logical value TRUE. Each element of the first vector is compared with the corresponding element of the second vector. The result of comparison is a Boolean value. & It is called Element-wise Logical AND operator. It combines each element of the first vector with the corresponding element of the second vector and gives a output TRUE if both the elements are TRUE. | It is called Element-wise Logical OR operator. It combines each element of the first vector with the corresponding element of the second vector and gives a output TRUE if one the elements is TRUE.
! It is called Logical NOT operator. Takes each element of the vector and gives the opposite logical value. && Called Logical AND operator. Takes first element of both the vectors and gives the TRUE only if both are TRUE. || Called Logical OR operator. Takes first element of both the vectors and gives the TRUE only if both are TRUE. These operators are used to assign values to vectors. These operators are used to for specific purpose and not general mathematical or logical computation. : Colon operator. It creates the series of numbers in sequence for a vector. %in% This operator is used to identify if an element belongs to a vector. %*% This operator is used to multiply a matrix with its transpose. 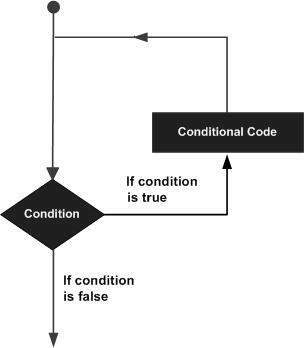 Decision making structures require the programmer to specify one or more conditions to be evaluated or tested by the program, along with a statement or statements to be executed if the condition is determined to be true, and optionally, other statements to be executed if the condition is determined to befalse. R provides the following types of decision making statements. Click the following links to check their detail. 3 switch statementA switch statement allows a variable to be tested for equality against a list of values. R programming language provides the following kinds of loop to handle looping requirements. Click the following links to check their detail. 1 repeat loopExecutes a sequence of statements multiple times and abbreviates the code that manages the loop variable. 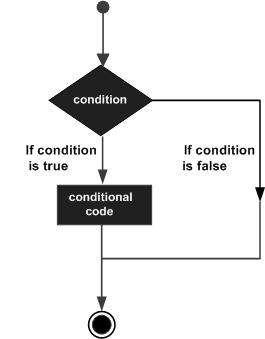 2 while loopRepeats a statement or group of statements while a given condition is true. It tests the condition before executing the loop body. 3 for loopLike a while statement, except that it tests the condition at the end of the loop body. R supports the following control statements. Click the following links to check their detail. 1 break statementTerminates the loop statement and transfers execution to the statement immediately following the loop. 2 Next statementThe next statement simulates the behavior of R switch. Simple examples of in-built functions are seq(), mean(), max(), sum(x) andpaste(…) etc. They are directly called by user written programs. You can refermost widely used R functions. Any value written within a pair of single quote or double quotes in R is treated as a string. Internally R stores every string within double quotes, even when you create them with single quote. The quotes at the beginning and end of a string should be both double quotes or both single quote. They can not be mixed. Double quotes can be inserted into a string starting and ending with single quote. Following examples clarify the rules about creating a string in R.
b <- "Start and end with double quotes"
c <- "single quote ' in between double quotes"
 "Start and end with single quote"
 "Start and end with double quotes"
 "single quote ' in between double quote"
 "Double quote \" in between single quote"
g <- "Double quotes " inside double quotes"
When we run the script it fails giving below results. Many strings in R are combined using the paste() function. It can take any number of arguments to be combined together. … represents any number of arguments to be combined. sep represents any separator between the arguments. It is optional. collapse is used to eliminate the space in between two strings. But not the space within two words of one string. c <- "are you? " "Hello How are you? " Numbers and strings can be formatted to a specific style using format()function. x is the vector input. digits is the total number of digits displayed. nsmall is the minimum number of digits to the right of the decimal point. scientific is set to TRUE to display scientific notation. width indicates the minimum width to be displayed by padding blanks in the beginning. justify is the display of the string to left, right or center. # Total number of digits displayed. Last digit rounded off. # Display numbers in scientific notation. # The minimum number of digits to the right of the decimal point. # Format treats everything as a string. # Numbers are padded with blank in the beginning for width. # Justfy string with center. This function counts the number of characters including spaces in a string. These functions change the case of characters of a string. # Changing to Upper case. # Changing to lower case. This function extracts parts of a String. x is the character vector input. first is the position of the first character to be extracted. last is the position of the last character to be extracted. # Extract characters from 5th to 7th position. Vectors are the most basic R data objects and there are six types of atomic vectors. They are logical, integer, double, complex, character and raw. Even when you write just one value in R, it becomes a vector of length 1 and belongs to one of the above vector types. # Atomic vector of type character. # Atomic vector of type double. # Atomic vector of type integer. # Atomic vector of type logical. # Atomic vector of type complex. # Atomic vector of type raw. # Creating a sequence from 5 to 13. # Creating a sequence from 6.6 to 12.6. # If the final element specified does not belong to the sequence then it is discarded. # Create vector with elements from 5 to 9 incrementing by 0.4. The non-character values are coerced to character type if one of the elements is a character. # The logical and numeric values are converted to characters. Elements of a Vector are accessed using indexing. The [ ] brackets are used for indexing. Indexing starts with position 1. Giving a negative value in the index drops that element from result.TRUE, FALSE or 0 and 1 can also be used for indexing. # Accessing vector elements using 0/1 indexing. "Sun" "Tue" "Wed" "Fri" "Sat"
# Sort the elements of the vector. # Sort the elements in the reverse order. # Sorting character vectors in reverse order. Lists are the R objects which contain elements of different types like − numbers, strings, vectors and another list inside it. A list can also contain a matrix or a function as its elements. List is created using list() function. # Create a list containing strings, numbers, vectors and a logical values. The list elements can be given names and they can be accessed using these names. # Create a list containing a vector, a matrix and a list. # Give names to the elements in the list. Elements of the list can be accessed by the index of the element in the list. In case of named lists it can also be accessed using the names. # Access the first element of the list. # Access the thrid element. As it is also a list, all its elements will be printed. # Access the list element using the name of the element. We can add, delete and update list elements as shown below. We can add and delete elements only at the end of a list. But we can update any element. # Add element at the end of the list. # Remove the last element. # Print the 4th Element. # Update the 3rd Element. You can merge many lists into one list by placing all the lists inside one list() function. # Merge the two lists. # Print the merged list. A list can be converted to a vector so that the elements of the vector can be used for further manipulation. All the arithmetic operations on vectors can be applied after the list is converted into vectors. To do this conversion, we use theunlist() function. It takes the list as input and produces a vector. # Convert the lists to vectors. Matrices are the R objects in which the elements are arranged in a two-dimensional rectangular layout. They contain elements of the same atomic types. Though we can create a matrix containing only characters or only logical values, they are not of much use. We use matrices containing numeric elements to be used in mathematical calculations. A Matrix is created using the matrix() function. data is the input vector which becomes the data elements of the matrix. nrow is the number of rows to be created. ncol is the number of columns to be created. byrow is a logical clue. If TRUE then the input vector elements are arranged by row. dimname is the names assigned to the rows and columns. Elements of a matrix can be accessed by using the column and row index of the element. We consider the matrix P above to find the specific elements below. Various mathematical operations are performed on the matrices using the R operators. The result of the operation is also a matrix. The dimensions (number of rows and columns) should be same for the matrices involved in the operation. Arrays are the R data objects which can store data in more than two dimensions. For example − If we create an array of dimension (2, 3, 4) then it creates 4 rectangular matrices each with 2 rows and 3 columns. Arrays can store only data type. An array is created using the array() function. It takes vectors as input and uses the values in the dim parameter to create an array. The following example creates an array of two 3×3 matrices each with 3 rows and 3 columns. We can give names to the rows, columns and matrices in the array by using thedimnames parameter. As array is made up matrices in multiple dimensions, the operations on elements of array are carried out by accessing elements of the matrices. We can do calculations across the elements in an array using the apply()function. margin is the name of the data set used. fun is the function to be applied across the elements of the array. We use the apply() function below to calculate the sum of the elements in the rows of an array across all the matrices. Factors are the data objects which are used to categorize the data and store it as levels. They can store both strings and integers. They are useful in the columns which have a limited number of unique values. Like “Male, “Female” and True, False etc. They are useful in data analysis for statistical modeling. Factors are created using the factor () function by taking a vector as input. # Create a vector as input. # Apply the factor function. "East"  "West"  "East"  "North" "North" "East"  "West"  "West"  "West"  "East" "North"
On creating any data frame with a column of text data, R treats the text column as categorical data and creates factors on it. # Create the vectors for data frame. # Test if the gender column is a factor. # Print the gender column so see the levels. The order of the levels in a factor can be changed by applying the factor function again with new order of the levels. # Apply the factor function with required order of the level. We can generate factor levels by using the gl() function. It takes two integers as input which indicates how many levels and how many times each level. n is a integer giving the number of levels. k is a integer giving the number of replications. labels is a vector of labels for the resulting factor levels. A data frame is a table or a two-dimensional array-like structure in which each column contains values of one variable and each row contains one set of values from each column. The structure of the data frame can be seen by using str() function. The statistical summary and nature of the data can be obtained by applyingsummary() function. Extract specific column from a data frame using column name. A data frame can be expanded by adding columns and rows. Just add the column vector using a new column name. To add more rows permanently to an existing data frame, we need to bring in the new rows in the same structure as the existing data frame and use therbind() function. In the example below we create a data frame with new rows and merge it with the existing data frame to create the final data frame. R packages are a collection of R functions, complied code and sample data. They are stored under a directory called “library” in the R environment. By default, R installs a set of packages during installation. More packages are added later, when they are needed for some specific purpose. When we start the R console, only the default packages are available by default. Other packages which are already installed have to be loaded explicitly to be used by the R program that is going to use them. All the packages available in R language are listed at R Packages. Below is a list of commands to be used to check, verify and use the R packages. When we execute the above code, it produces the following result. It may vary depending on the local settings of your pc. There are two ways to add new R packages. One is installing directly from the CRAN directory and another is downloading the package to your local system and installing it manually. The following command gets the packages directly from CRAN webpage and installs the package in the R environment. You may be prompted to choose a nearest mirror. Choose the one appropriate to your location. # Install the package named "XML". Go to the link R Packages to download the package needed. Save the package as a .zip file in a suitable location in the local system. Now you can run the following command to install this package in the R environment. # Install the package named "XML"
Before a package can be used in the code, it must be loaded to the current R environment. You also need to load a package that is already installed previously but not available in the current environment. # Load the package named "XML"
Data Reshaping in R is about changing the way data is organized into rows and columns. Most of the time data processing in R is done by taking the input data as a data frame. It is easy to extract data from the rows and columns of a data frame but there are situations when we need the data frame in a format that is different from format in which we received it. R has many functions to split, merge and change the rows to columns and vice-versa in a data frame. We can join multiple vectors to create a data frame using the cbind()function. Also we can merge two data frames using rbind() function. # Combine above three vectors into one data frame. # Combine rows form both the data frames. We can merge two data frames by using the merge() function. The data frames must have same column names on which the merging happens. In the example below, we consider the data sets about Diabetes in Pima Indian Women available in the library names “MASS”. we merge the two data sets based on the values of blood pressure(“bp”) and body mass index(“bmi”). On choosing these two columns for merging, the records where values of these two variables match in both data sets are combined together to form a single data frame. One of the most interesting aspects of R programming is about changing the shape of the data in multiple steps to get a desired shape. The functions used to do this are called melt() and cast(). We consider the dataset called ships present in the library called “MASS”. Now we melt the data to organize it, converting all columns other than type and year into multiple rows. We can cast the molten data into a new form where the aggregate of each type of ship for each year is created. It is done using the cast() function. In R, we can read data from files stored outside the R environment. We can also write data into files which will be stored and accessed by the operating system. R can read and write into various file formats like csv, excel, xml etc. In this chapter we will learn to read data from a csv file and then write data into a csv file. The file should be present in current working directory so that R can read it. Of course we can also set our own directory and read files from there. You can check which directory the R workspace is pointing to using thegetwd() function. You can also set a new working directory usingsetwd()function. # Get and print current working directory. # Set current working directory. This result depends on your OS and your current directory where you are working. The csv file is a text file in which the values in the columns are separated by a comma. Let’s consider the following data present in the file named input.csv. You can create this file using windows notepad by copying and pasting this data. Save the file as input.csv using the save As All files(*. *) option in notepad. By default the read.csv() function gives the output as a data frame. This can be easily checked as follows. Also we can check the number of columns and rows. Once we read data in a data frame, we can apply all the functions applicable to data frames as explained in subsequent section. # Create a data frame. # Get the max salary from data frame. We can fetch rows meeting specific filter criteria similar to a SQL where clause. # Get the person detail having max salary. R can create csv file form existing data frame. The write.csv() function is used to create the csv file. This file gets created in the working directory. # Write filtered data into a new file. Here the column X comes from the data set newper. This can be dropped using additional parameters while writing the file. Microsoft Excel is the most widely used spreadsheet program which stores data in the .xls or .xlsx format. R can read directly from these files using some excel specific packages. Few such packages are – XLConnect, xlsx, gdata etc. We will be using xlsx package. R can also write into excel file using this package. You can use the following command in the R console to install the “xlsx” package. It may ask to install some additional packages on which this package is dependent. Follow the same command with required package name to install the additional packages. Use the following command to verify and load the “xlsx” package. When the script is run we get the following output. Open Microsoft excel. Copy and paste the following data in the work sheet named as sheet1. Also copy and paste the following data to another worksheet and rename this worksheet to “city”. Save the Excel file as “input.xlsx”. You should save it in the current working directory of the R workspace. The input.xlsx is read by using the read.xlsx() function as shown below. The result is stored as a data frame in the R environment. # Read the first worksheet in the file input.xlsx. A binary file is a file that contains information stored only in form of bits and bytes. (0’s and 1’s). They are not human readable as the bytes in it translate to characters and symbols which contain many other non-printable characters. Attempting to read a binary file using any text editor will show characters like Ø and ð. The binary file has to be read by specific programs to be useable. For example, the binary file of a Microsoft Word program can be read to a human readable form only by the Word program. Which indicates that, besides the human readable text, there is a lot more information like formatting of characters and page numbers etc., which are also stored along with alphanumeric characters. And finally a binary file is a continuous sequence of bytes. The line break we see in a text file is a character joining first line to the next. Sometimes, the data generated by other programs are required to be processed by R as a binary file. Also R is required to create binary files which can be shared with other programs. R has two functions WriteBin() and readBin() to create and read binary files. con is the connection object to read or write the binary file. object is the binary file which to be written. what is the mode like character, integer etc. representing the bytes to be read. n is the number of bytes to read from the binary file. We consider the R inbuilt data “mtcars”. First we create a csv file from it and convert it to a binary file and store it as a OS file. Next we read this binary file created into R.
We read the data frame “mtcars” as a csv file and then write it as a binary file to the OS. # Store 5 records from the csv file as a new data frame. # Create a connection object to write the binary file using mode "wb". # Write the column names of the data frame to the connection object. # Write the records in each of the column to the file. # Close the file for writing so that it can be read by other program. The binary file created above stores all the data as continuous bytes. So we will read it by choosing appropriate values of column names as well as the column values. # Create a connection object to read the file in binary mode using "rb". # First read the column names. n = 3 as we have 3 columns. # Next read the column values. n = 18 as we have 3 column names and 15 values. # Read the values from 4th byte to 8th byte which represents "cyl". # Read the values form 9th byte to 13th byte which represents "am". # Read the values form 9th byte to 13th byte which represents "gear". # Combine all the read values to a dat frame. As we can see, we got the original data back by reading the binary file in R.
XML is a file format which shares both the file format and the data on the World Wide Web, intranets, and elsewhere using standard ASCII text. It stands for Extensible Markup Language (XML). Similar to HTML it contains markup tags. But unlike HTML where the markup tag describes structure of the page, in xml the markup tags describe the meaning of the data contained into he file. You can read a xml file in R using the “XML” package. This package can be installed using following command. Create a XMl file by copying the below data into a text editor like notepad. Save the file with a .xml extension and choosing the file type as all files(*.*). The xml file is read by R using the function xmlParse(). It is stored as a list in R.
# Give the input file name to the function. # Load the packages required to read XML files. # Exract the root node form the xml file. Let’s look at the first record of the parsed file. It will give us an idea of the various elements present in the top level node. # Get the first element of the first node. # Get the fifth element of the first node. # Get the second element of the third node. To handle the data effectively in large files we read the data in the xml file as a data frame. Then process the data frame for data analysis. # Convert the input xml file to a data frame. As the data is now available as a dataframe we can use data frame related function to read and manipulate the file. In the R console, you can issue the following command to install the rjson package. Create a JSON file by copying the below data into a text editor like notepad. Save the file with a .json extension and choosing the file type as all files(*.*). The JSON file is read by R using the function from JSON(). It is stored as a list in R.
# Load the package required to read JSON files. "1"   "2"   "3"   "4"   "5"   "6"   "7"   "8"
 "Rick"     "Dan"      "Michelle" "Ryan"     "Gary"     "Nina"     "Simon"    "Guru"
 "623.3"  "515.2"  "611"    "729"    "843.25" "578"    "632.8"  "722.5"
 "1/1/2012"   "9/23/2013"  "11/15/2014" "5/11/2014"  "3/27/2015"  "5/21/2013"
 "IT"         "Operations" "IT"         "HR"         "Finance"    "IT"
We can convert the extracted data above to a R data frame for further analysis using the as.data.frame() function. # Convert JSON file to a data frame. Many websites provide data for consumption by its users. For example the World Health Organization(WHO) provides reports on health and medical information in the form of CSV, txt and XML files. Using R programs, we can programmatically extract specific data from such websites. Some packages in R which are used to scrap data form the web are − “RCurl”,XML”, and “stringr”. They are used to connect to the URL’s, identify required links for the files and download them to the local environment. The following packages are required for processing the URL’s and links to the files. If they are not available in your R Environment, you can install them using following commands. We will visit the URL weather data and download the CSV files using R for the year 2015. We will use the function getHTMLLinks() to gather the URLs of the files. Then we will use the function downlaod.file() to save the files to the local system. As we will be applying the same code again and again for multiple files, we will create a function to be called multiple times. The filenames are passed as parameters in form of a R list object to this function. # Gather the html links present in the webpage. # Identify only the links which point to the JCMB 2015 files. # Store the file names as a list. # Create a function to download the files by passing the URL and filename list. # Now apply the l_ply function and save the files into the current R working directory. After running the above code, you can locate the following files in the current R working directory. The data is Relational database systems are stored in a normalized format. So, to carry out statistical computing we will need very advanced and complex Sql queries. But R can connect easily to many relational databases like MySql, Oracle, Sql server etc. and fetch records from them as a data frame. Once the data is available in the R environment, it becomes a normal R data set and can be manipulated or analyzed using all the powerful packages and functions. In this tutorial we will be using MySql as our reference database for connecting to R.
R has a built-in package named “RMySQL” which provides native connectivity between with MySql database. You can install this package in the R environment using the following command. Once the package is installed we create a connection object in R to connect to the database. It takes the username, password, database name and host name as input. # Create a connection Object to MySQL database. # We will connect to the sampel database named "sakila" that comes with MySql installation. # List the tables available in this database. We can query the database tables in MySql using the function dbSendQuery(). The query gets executed in MySql and the result set is returned using the Rfetch() function. Finally it is stored as a data frame in R.
# Query the "actor" tables to get all the rows. # Store the result in a R data frame object. n = 5 is used to fetch first 5 rows. We can pass any valid select query to get the result. # Fetch all the records(with n = -1) and store it as a data frame. We can update the rows in a Mysql table by passing the update query to the dbSendQuery() function. After executing the above code we can see the table updated in the MySql Environment. values('New Mazda RX4 Wag', 21, 6, 168.5, 110, 3.9, 2.875, 17.02, 0, 1, 4, 4)"
After executing the above code we can see the row inserted into the table in the MySql Environment. We can create tables in the MySql using the function dbWriteTable(). It overwrites the table if it already exists and takes a data frame as input. # Create the connection object to the database where we want to create the table. # Use the R data frame "mtcars" to create the table in MySql. # All the rows of mtcars are taken inot MySql. After executing the above code we can see the table created in the MySql Environment. We can drop the tables in MySql database passing the drop table statement into the dbSendQuery() in the same way we used it for querying data from tables. After executing the above code we can see the table is dropped in the MySql Environment. R Programming language has numerous libraries to create charts and graphs. 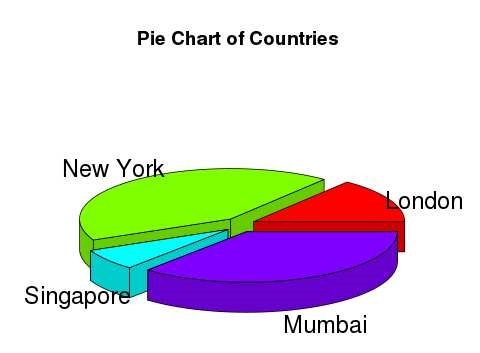 A pie-chart is a representation of values as slices of a circle with different colors. 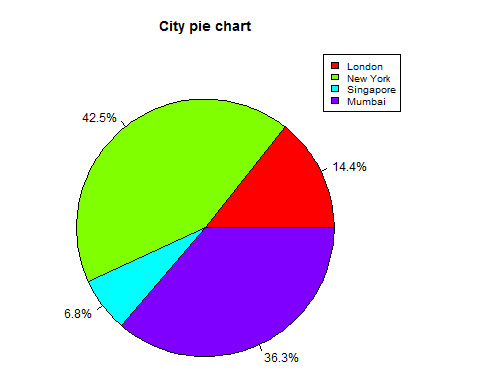 The slices are labeled and the numbers corresponding to each slice is also represented in the chart. x is a vector containing the numeric values used in the pie chart. labels is used to give description to the slices. radius indicates the radius of the circle of the pie chart. (value between −1 and +1). main indicates the title of the chart. col indicates the color palette. clockwise is a logical value indicating if the slices are drawn clockwise or anti clockwise. 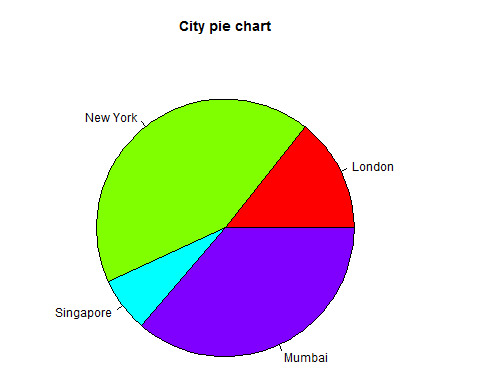 A very simple pie-chart is created using just the input vector and labels. The below script will create and save the pie chart in the current R working directory. # Create data for the graph. We can expand the features of the chart by adding more parameters to the function. We will use parameter main to add a title to the chart and another parameter is col which will make use of rainbow colour pallet while drawing the chart. The length of the pallet should be same as the number of values we have for the chart. Hence we use length(x). The below script will create and save the pie chart in the current R working directory. # Plot the chart with title and rainbow color pallet. We can add slice percentage and a chart legend by creating additional chart variables. 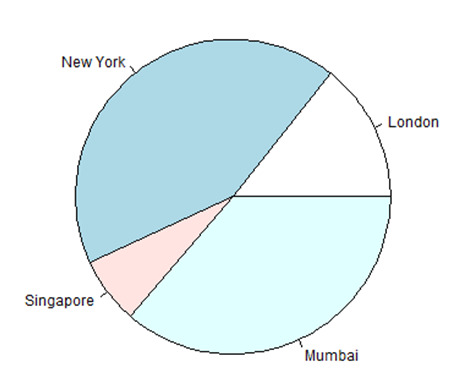 A pie chart with 3 dimensions can be drawn using additional packages. The package plotrix has a function called pie3D() that is used for this. A bar chart represents data in rectangular bars with length of the bar proportional to the value of the variable. 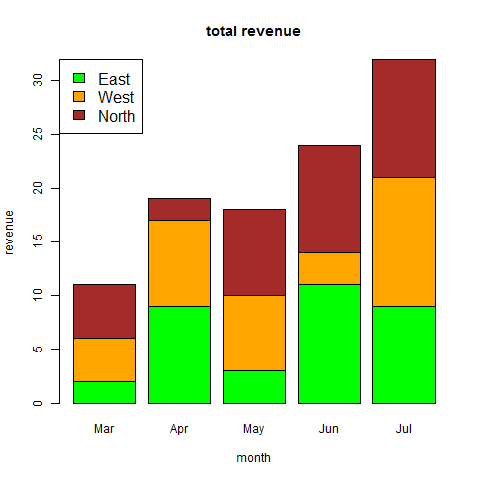 R uses the function barplot() to create bar charts. 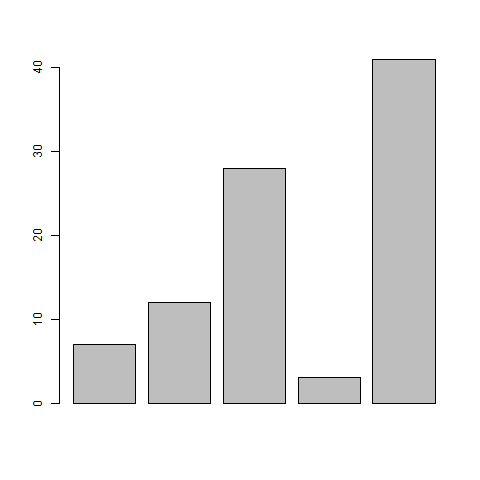 R can draw both vertical and Horizontal bars in the bar chart. In bar chart each of the bars can be given different colors. H is a vector or matrix containing numeric values used in bar chart. xlab is the label for x axis. ylab is the label for y axis. main is the title of the bar chart. names.arg is a vector of names appearing under each bar. col is used to give colors to the bars in the graph. 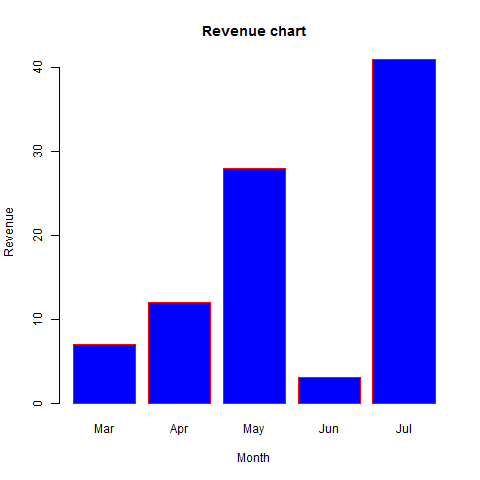 A simple bar chart is created using just the input vector and the name of each bar. The below script will create and save the bar chart in the current R working directory. The features of the bar chart can be expanded by adding more parameters. Themain parameter is used to add title. The col parameter is used to add colors to the bars. The args.name is a vector having same number of values as the input vector to describe the meaning of each bar. We can create bar chart with groups of bars and stacks in each bar by using a matrix as input values. #Create the matrix of the values. Boxplots are a measure of how well distributed is the data in a data set. It divides the data set into three quartiles. This graph represents the minimum, maximum, median, first quartile and third quartile in the data set. It is also useful in comparing the distribution of data across data sets by drawing boxplots for each of them. Boxplots are created in R by using the boxplot() function. We use the data set “mtcars” available in the R environment to create a basic boxplot. Let’s look at the columns “mpg” and “cyl” in mtcars. 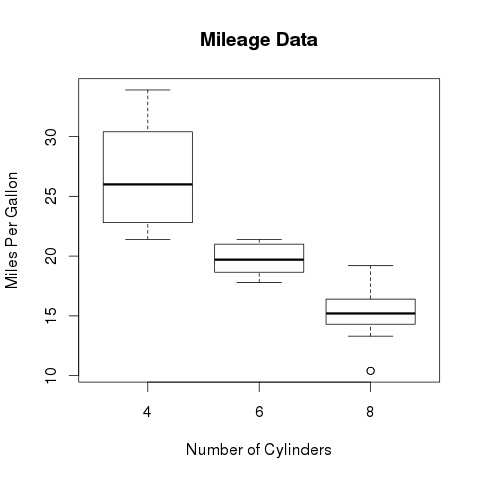 The below script will create a boxplot graph for the relation between mpg (miles per gallon) and cyl (number of cylinders). We can draw boxplot with notch to find out how the medians of different data groups match with each other. The below script will create a boxplot graph with notch for each of the data group. A histogram represents the frequencies of values of a variable bucketed into ranges. Histogram is similar to bar chat but the difference is it groups the values into continuous ranges. Each bar in histogram represents the height of the number of values present in that range. 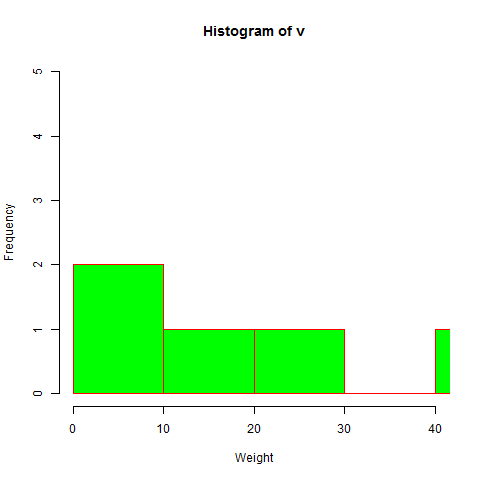 R creates histogram using hist() function. This function takes a vector as an input and uses some more parameters to plot histograms. 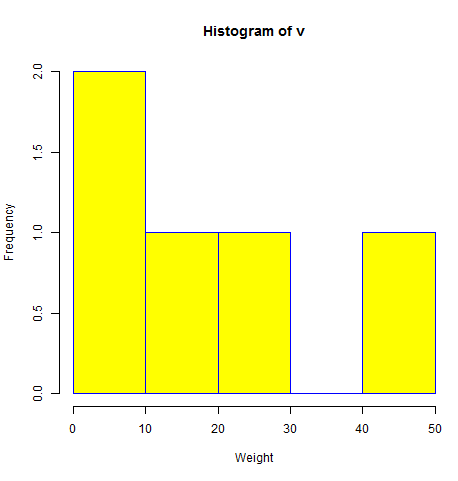 v is a vector containing numeric values used in histogram. main indicates title of the chart. col is used to set color of the bars. border is used to set border color of each bar. xlab is used to give description of x-axis. xlim is used to specify the range of values on the x-axis. ylim is used to specify the range of values on the y-axis. breaks is used to mention the width of each bar. A simple histogram is created using input vector, label, col and border parameters. The script given below will create and save the histogram in the current R working directory. To specify the range of values allowed in X axis and Y axis, we can use the xlim and ylim parameters. The width of each of the bar can be decided by using breaks. A line chart is a graph that connects a series of points by drawing line segments between them. These points are ordered in one of their coordinate (usually the x-coordinate) value. Line charts are usually used in identifying the trends in data. 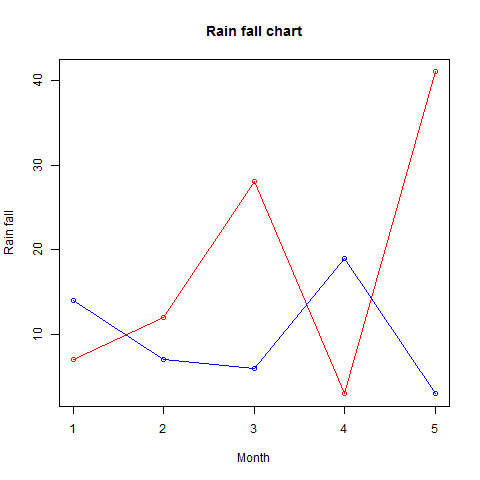 The plot() function in R is used to create the line graph. v is a vector containing the numeric values. type takes the value “p” to draw only the points, “l” to draw only the lines and “o” to draw both points and lines. main is the Title of the chart. col is used to give colors to both the points and lines. A simple line chart is created using the input vector and the type parameter as “O”. 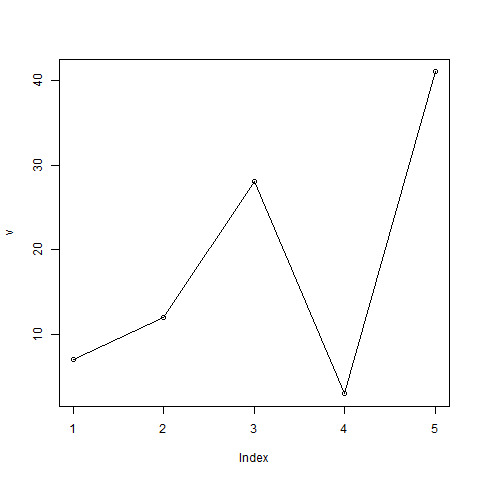 The below script will create and save a line chart in the current R working directory. The features of the line chart can be expanded by using additional parameters. We add color to the points and lines, give a title to the chart and add labels to the axes. More than one line can be drawn on the same chart by using thelines()function. Scatterplots show many points plotted in the Cartesian plane. Each point represents the values of two variables. One variable is chosen in the horizontal axis and another in the vertical axis. The simple scatterplot is created using the plot() function. We use the data set “mtcars” available in the R environment to create a basic scatterplot. Let’s use the columns “wt” and “mpg” in mtcars. 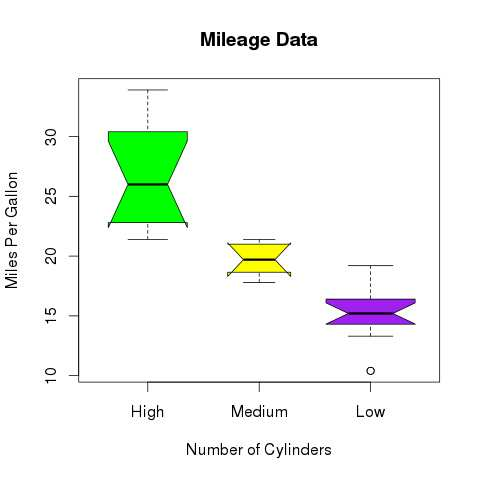 The below script will create a scatterplot graph for the relation between wt(weight) and mpg(miles per gallon). # Get the input values. 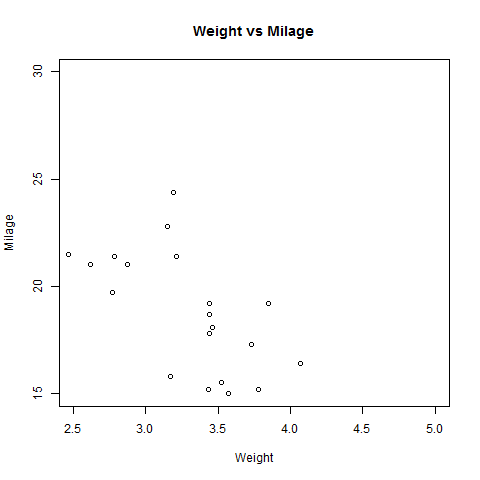 # Plot the chart for cars with weight between 2.5 to 5 and mileage between 15 and 30.
main = "Weight vs Milage"
When we have more than two variables and we want to find the correlation between one variable versus the remaining ones we use scatterplot matrix. 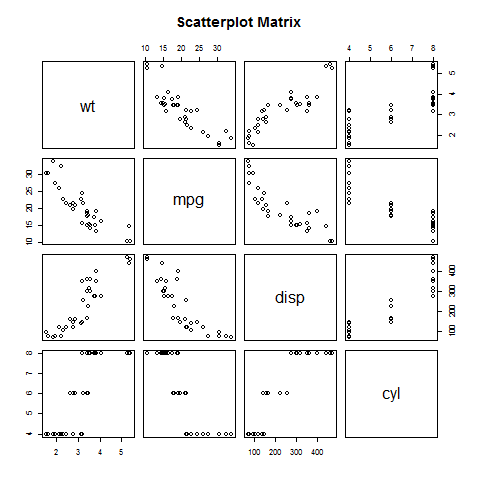 We use pairs() function to create matrices of scatterplots. Each variable is paired up with each of the remaining variable. A scatterplot is plotted for each pair. # Plot the matrices between 4 variables giving 12 plots. # One variable with 3 others and total 4 variables. When the above code is executed we get the following output. Statistical analysis in R is performed by using many in-built functions. Most of these functions are part of the R base package. These functions take R vector as an input along with the arguments and give the result. The functions we are discussing in this chapter are mean, median and mode. The function mean() is used to calculate this in R.
x is the input vector. trim is used to drop some observations from both end of the sorted vector. na.rm is used to remove the missing values from the input vector. When trim parameter is supplied, the values in the vector get sorted and then the required numbers of observations are dropped from calculating the mean. When trim = 0.3, 3 values from each end will be dropped from the calculations to find mean. In this case the sorted vector is (−21, −5, 2, 3, 4.2, 7, 8, 12, 18, 54) and the values removed from the vector for calculating mean are (−21,−5,2) from left and (12,18,54) from right. If there are missing values, then the mean function returns NA. To drop the missing values from the calculation use na.rm = TRUE. which means remove the NA values. # Find mean dropping NA values. The middle most value in a data series is called the median. 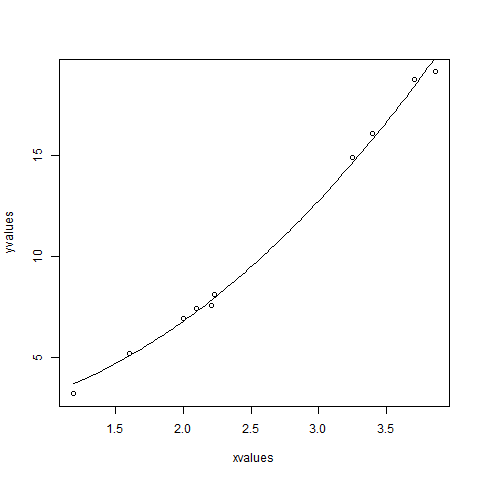 The median()function is used in R to calculate this value. The mode is the value that has highest number of occurrences in a set of data. Unike mean and median, mode can have both numeric and character data. R does not have a standard in-built function to calculate mode. So we create a user function to calculate mode of a data set in R. This function takes the vector as input and gives the mode value as output. # Create the vector with numbers. # Create the vector with characters. Regression analysis is a very widely used statistical tool to establish a relationship model between two variables. One of these variable is called predictor variable whose value is gathered through experiments. The other variable is called response variable whose value is derived from the predictor variable. In Linear Regression these two variables are related through an equation, where exponent (power) of both these variables is 1. Mathematically a linear relationship represents a straight line when plotted as a graph. A non-linear relationship where the exponent of any variable is not equal to 1 creates a curve. 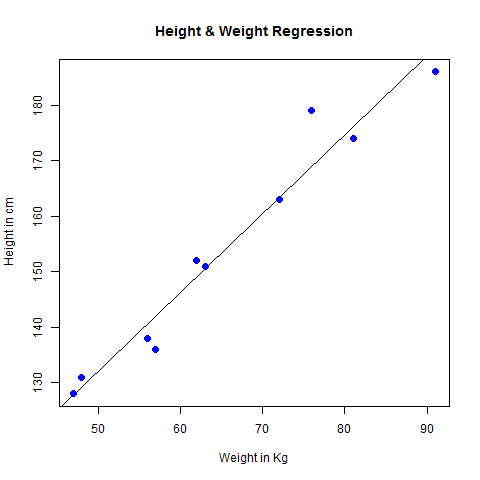 A simple example of regression is predicting weight of a person when his height is known. To do this we need to have the relationship between height and weight of a person. Carry out the experiment of gathering a sample of observed values of height and corresponding weight. Create a relationship model using the lm() functions in R.
Get a summary of the relationship model to know the average error in prediction. Also called residuals. To predict the weight of new persons, use the predict() function in R.
This function creates the relationship model between the predictor and the response variable. formula is a symbol presenting the relation between x and y.
data is the vector on which the formula will be applied. object is the formula which is already created using the lm() function. newdata is the vector containing the new value for predictor variable. Multiple regression is an extension of linear regression into relationship between more than two variables. In simple linear relation we have one predictor and one response variable, but in multiple regression we have more than one predictor variable and one response variable. a, b1, b2…bn are the coefficients. x1, x2, …xn are the predictor variables. We create the regression model using the lm() function in R. The model determines the value of the coefficients using the input data. Next we can predict the value of the response variable for a given set of predictor variables using these coefficients. formula is a symbol presenting the relation between the response variable and predictor variables. Consider the data set “mtcars” available in the R environment. It gives a comparison between different car models in terms of mileage per gallon (mpg), cylinder displacement(“disp”), horse power(“hp”), weight of the car(“wt”) and some more parameters. The goal of the model is to establish the relationship between “mpg” as a response variable with “disp”,”hp” and “wt” as predictor variables. We create a subset of these variables from the mtcars data set for this purpose. Based on the above intercept and coefficient values, we create the mathematical equation. We can use the regression equation created above to predict the mileage when a new set of values for displacement, horse power and weight is provided. The Logistic Regression is a regression model in which the response variable (dependent variable) has categorical values such as True/False or 0/1. It actually measures the probability of a binary response as the value of response variable based on the mathematical equation relating it with the predictor variables. a and b are the coefficients which are numeric constants. The function used to create the regression model is the glm() function. formula is the symbol presenting the relationship between the variables. data is the data set giving the values of these variables. family is R object to specify the details of the model. It’s value is binomial for logistic regression. The in-built data set “mtcars” describes different models of a car with their various engine specifications. In “mtcars” data set, the transmission mode (automatic or manual) is described by the column am which is a binary value (0 or 1). We can create a logistic regression model between the columns “am” and 3 other columns – hp, wt and cyl. # Select some columns form mtcars. We use the glm() function to create the regression model and get its summary for analysis. hp           0.03259    0.01886   1.728   0.0840 . In the summary as the p-value in the last column is more than 0.05 for the variables “cyl” and “hp”, we consider them to be insignificant in contributing to the value of the variable “am”. Only weight (wt) impacts the “am” value in this regression model. In a random collection of data from independent sources, it is generally observed that the distribution of data is normal. Which means, on plotting a graph with the value of the variable in the horizontal axis and the count of the values in the vertical axis we get a bell shape curve. The center of the curve represents the mean of the data set. In the graph, fifty percent of values lie to the left of the mean and the other fifty percent lie to the right of the graph. 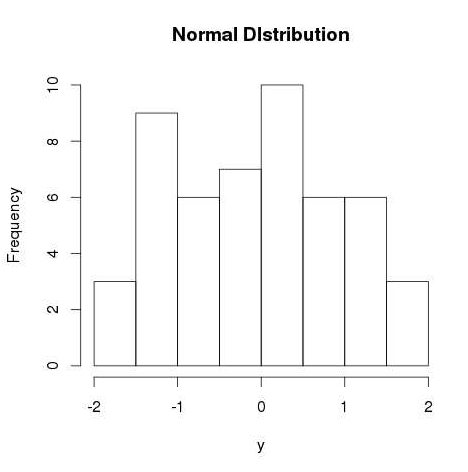 This is referred as normal distribution in statistics. 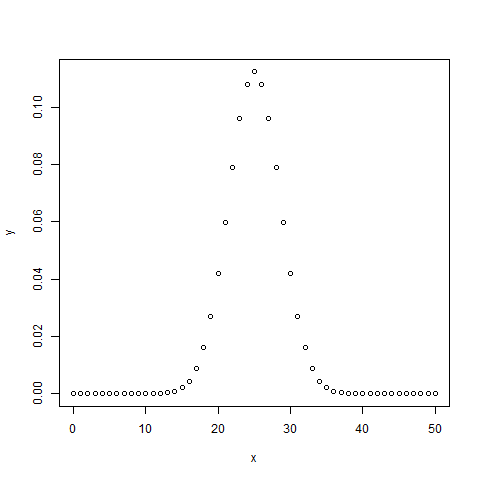 R has four in built functions to generate normal distribution. They are described below. n is number of observations(sample size). mean is the mean value of the sample data. It’s default value is zero. sd is the standard deviation. It’s default value is 1. This function gives height of the probability distribution at each point for a given mean and standard deviation. 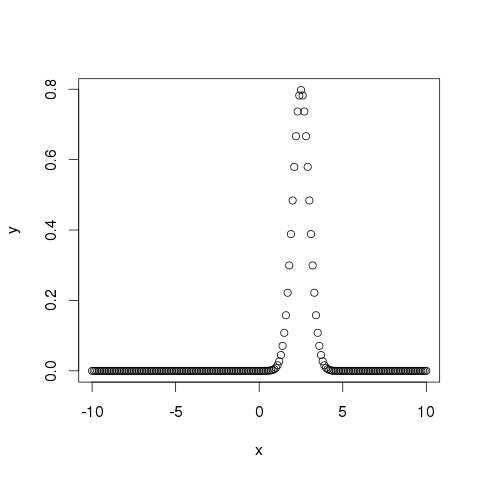 This function gives the probability of a normally distributed random number to be less that the value of a given number. It is also called “Cumulative Distribution Function”. This function takes the probability value and gives a number whose cumulative value matches the probability value. 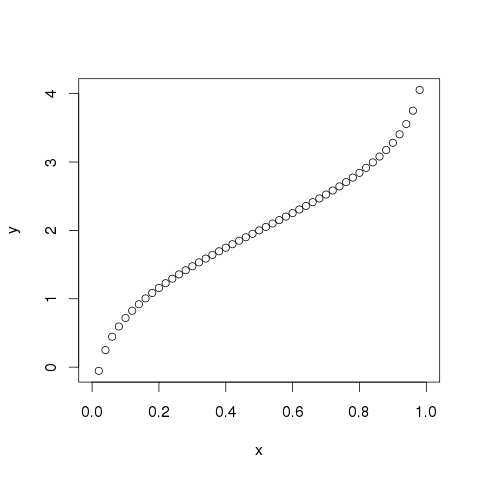 This function is used to generate random numbers whose distribution is normal. It takes the sample size as input and generates that many random numbers. We draw a histogram to show the distribution of the generated numbers. The binomial distribution model deals with finding the probability of success of an event which has only two possible outcomes in a series of experiments. For example, tossing of a coin always gives a head or a tail. The probability of finding exactly 3 heads in tossing a coin repeatedly for 10 times is estimated during the binomial distribution. R has four in-built functions to generate binomial distribution. They are described below. n is number of observations. size is the number of trials. prob is the probability of success of each trial. 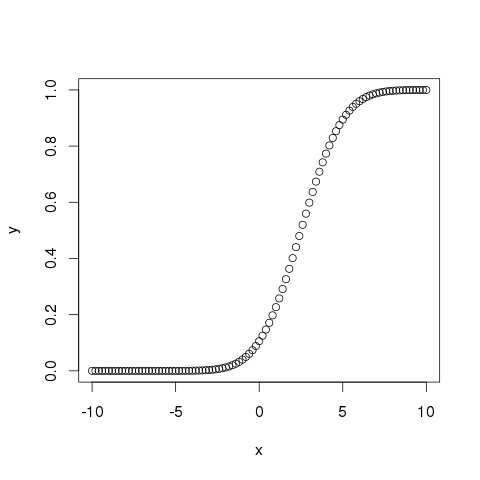 This function gives the probability density distribution at each point. # Create a sample of 50 numbers which are incremented by 1. # Create the binomial distribution. # Plot the graph for this sample. This function gives the cumulative probability of an event. It is a single value representing the probability. # Probability of getting 26 or less heads from a 51 tosses of a coin. # How many heads will have a probability of 0.25 will come out when a coin is tossed 51 times. This function generates required number of random values of given probability from a given sample. # Find 8 random values from a sample of 150 with probability of 0.4. Poisson Regression involves regression models in which the response variable is in the form of counts and not fractional numbers. For example, the count of number of births or number of wins in a football match series. Also the values of the response variables follow a Poisson distribution. a and b are the numeric coefficients. The function used to create the Poisson regression model is the glm() function. family is R object to specify the details of the model. It’s value is ‘Poisson’ for Logistic Regression. We have the in-built data set “warpbreaks” which describes the effect of wool type (A or B) and tension (low, medium or high) on the number of warp breaks per loom. Let’s consider “breaks” as the response variable which is a count of number of breaks. The wool “type” and “tension” are taken as predictor variables. In the summary we look for the p-value in the last column to be less than 0.05 to consider an impact of the predictor variable on the response variable. As seen the wooltype B having tension type M and H have impact on the count of breaks. Consider the R built in data set mtcars. In it we observer that the field “am” represents the type of transmission (auto or manual). It is a categorical variable with values 0 and 1. The miles per gallon value(mpg) of a car can also depend on it besides the value of horse power(“hp”). We study the effect of the value of “am” on the regression between “mpg” and “hp”. It is done by using the aov() function followed by the anova() function to compare the multiple regressions. Create a data frame containing the fields “mpg”, “hp” and “am” from the data set mtcars. Here we take “mpg” as the response variable, “hp” as the predictor variable and “am” as the categorical variable. We create a regression model taking “hp” as the predictor variable and “mpg” as the response variable taking into account the interaction between “am” and “hp”. Time series is a series of data points in which each data point is associated with a timestamp. A simple example is the price of a stock in the stock market at different points of time on a given day. 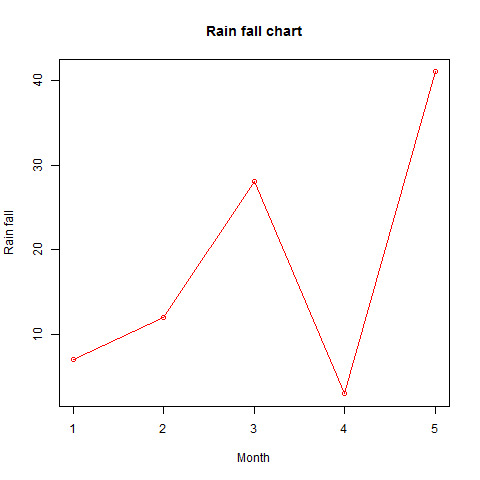 Another example is the amount of rainfall in a region at different months of the year. R language uses many functions to create, manipulate and plot the time series data. The data for the time series is stored in an R object called time-series object. It is also a R data object like a vector or data frame. 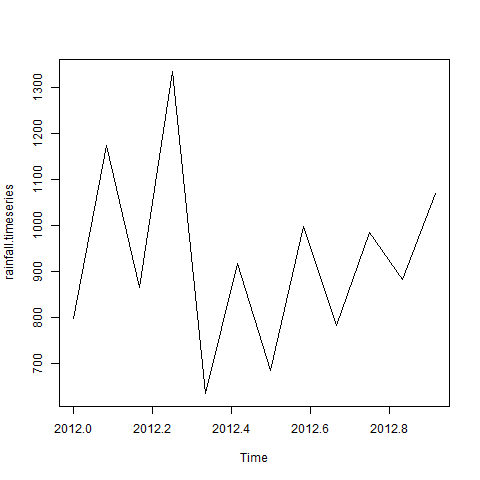 The time series object is created by using the ts() function. data is a vector or matrix containing the values used in the time series. start specifies the start time for the first observation in time series. end specifies the end time for the last observation in time series. frequency specifies the number of observations per unit time. Except the parameter “data” all other parameters are optional. Consider the annual rainfall details at a place starting from January 2012. We create an R time series object for a period of 12 months and plot it. # Get the data points in form of a R vector. # Convert it to a time series object. # Print the timeseries data. # Plot a graph of the time series. frequency = 12 pegs the data points for every month of a year. frequency = 4 pegs the data points for every quarter of a year. frequency = 6 pegs the data points for every 10 minutes of an hour. frequency = 24*6 pegs the data points for every 10 minutes of a day. 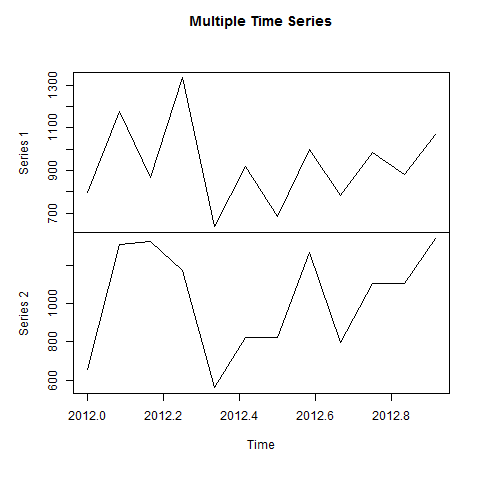 We can plot multiple time series in one chart by combining both the series into a matrix. # Convert them to a matrix. When modeling real world data for regression analysis, we observe that it is rarely the case that the equation of the model is a linear equation giving a linear graph. Most of the time, the equation of the model of real world data involves mathematical functions of higher degree like an exponent of 3 or a sin function. In such a scenario, the plot of the model gives a curve rather than a line. The goal of both linear and non-linear regression is to adjust the values of the model’s parameters to find the line or curve that comes closest to your data. On finding these values we will be able to estimate the response variable with good accuracy. In Least Square regression, we establish a regression model in which the sum of the squares of the vertical distances of different points from the regression curve is minimized. We generally start with a defined model and assume some values for the coefficients. We then apply the nls() function of R to get the more accurate values along with the confidence intervals. formula is a nonlinear model formula including variables and parameters. data is a data frame used to evaluate the variables in the formula. start is a named list or named numeric vector of starting estimates. We will consider a nonlinear model with assumption of initial values of its coefficients. Next we will see what is the confidence intervals of these assumed values so that we can judge how well these values fir into the model. Let’s assume the initial coefficients to be 1 and 3 and fit these values into nls() function. # Take the assumed values and fit into the model. # Plot the chart with new data by fitting it to a prediction from 100 data points. # Get the sum of the squared residuals. # Get the confidence intervals on the chosen values of the coefficients. We can conclude that the value of b1 is more close to 1 while the value of b2 is more close to 2 and not 3. Decision tree is a graph to represent choices and their results in form of a tree. The nodes in the graph represent an event or choice and the edges of the graph represent the decision rules or conditions. It is mostly used in Machine Learning and Data Mining applications using R.
Examples of use of decision tress is − predicting an email as spam or not spam, predicting of a tumor is cancerous or predicting a loan as a good or bad credit risk based on the factors in each of these. Generally, a model is created with observed data also called training data. Then a set of validation data is used to verify and improve the model. 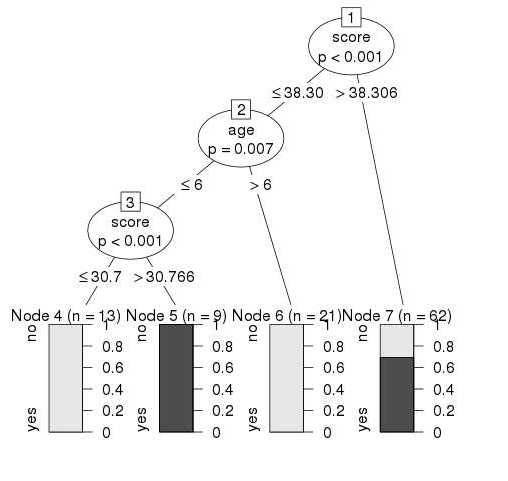 R has packages which are used to create and visualize decision trees. For new set of predictor variable, we use this model to arrive at a decision on the category (yes/No, spam/not spam) of the data. The R package “party” is used to create decision trees. Use the below command in R console to install the package. You also have to install the dependent packages if any. The package “party” has the function ctree() which is used to create and analyze decison tree. formula is a formula describing the predictor and response variables. data is the name of the data set used. We will use the R in-built data set named readingSkills to create a decision tree. It describes the score of someone’s readingSkills if we know the variables “age”,”shoesize”,”score” and whether the person is a native speaker or not. Here is the sample data. # Load the party package. It will automatically load other dependent packages. We will use the ctree() function to create the decision tree and see its graph. From the decision tree shown above we can conclude that anyone whose readingSkills score is less than 38.3 and age is more than 6 is not a native Speaker. In the random forest approach, a large number of decision trees are created. Every observation is fed into every decision tree. The most common outcome for each observation is used as the final output. A new observation is fed into all the trees and taking a majority vote for each classification model. An error estimate is made for the cases which were not used while building the tree. That is called an OOB (Out-of-bag) error estimate which is mentioned as a percentage. The R package “randomForest” is used to create random forests. The package “randomForest” has the function randomForest() which is used to create and analyze random forests. We will use the R in-built data set named readingSkills to create a decision tree. It describes the score of someone’s readingSkills if we know the variables “age”,”shoesize”,”score” and whether the person is a native speaker. We will use the randomForest() function to create the decision tree and see it’s graph. From the random forest shown above we can conclude that the shoesize and score are the important factors deciding if someone is a native speaker or not. Also the model has only 1% error which means we can predict with 99% accuracy. Survival analysis deals with predicting the time when a specific event is going to occur. It is also known as failure time analysis or analysis of time to death. For example predicting the number of days a person with cancer will survive or predicting the time when a mechanical system is going to fail. 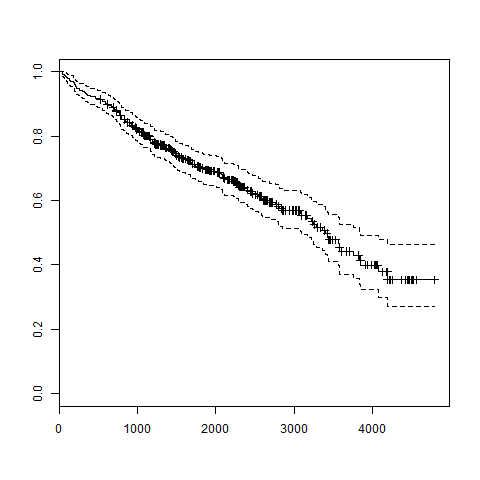 The R package named survival is used to carry out survival analysis. This package contains the function Surv() which takes the input data as a R formula and creates a survival object among the chosen variables for analysis. Then we use the function survfit() to create a plot for the analysis. time is the follow up time until the event occurs. event indicates the status of occurrence of the expected event. formula is the relationship between the predictor variables. We will consider the data set named “pbc” present in the survival packages installed above. It describes the survival data points about people affected with primary biliary cirrhosis (PBC) of the liver. Among the many columns present in the data set we are primarily concerned with the fields “time” and “status”. Time represents the number of days between registration of the patient and earlier of the event between the patient receiving a liver transplant or death of the patient. # Print first few rows. From the above data we are considering time and status for our analysis. Now we proceed to apply the Surv() function to the above data set and create a plot that will show the trend. # Create the survival object. The trend in the above graph helps us predicting the probability of survival at the end of a certain number of days. For example, we can build a data set with observations on people’s ice-cream buying pattern and try to correlate the gender of a person with the flavor of the ice-cream they prefer. If a correlation is found we can plan for appropriate stock of flavors by knowing the number of gender of people visiting. The function used for performing chi-Square test is chisq.test(). data is the data in form of a table containing the count value of the variables in the observation. We will take the Cars93 data in the “MASS” library which represents the sales of different models of car in the year 1993. The above result shows the dataset has many Factor variables which can be considered as categorical variables. For our model we will consider the variables “AirBags” and “Type”. Here we aim to find out any significant correlation between the types of car sold and the type of Air bags it has. If correlation is observed we can estimate which types of cars can sell better with what types of air bags. # Create a data frame from the main data set. # Create a table with the needed variables. # Perform the Chi-Square test. The result shows the p-value of less than 0.05 which indicates a string correlation.